Read anything great lately? Here are some of my favorites from the past month. A PERFECT DAY, by Lane Smith, is a beautifully produced picture book from Roaring Brook Press, written and illustrated by a master of the genre. A perfect day for cat, dog, chickadee, and squirrel gets turned around when Bear arrives on the scene, eager to enjoy his own perfect day. BEST FRINTS IN THE WHOLE UNIVERSE, by Antoinette Portis, shows how the more things are different on planet Boborp, the more they are just like on Earth. Yelfred and Omek have been best frints since they were little blobbies, but teef are long and tempers are short, and stuff needs to be worked out! ALL EARS, ALL EYES, by Richard Jackson, illustrated by Katherine Tillotson, is a bedtime poem by the legendary editor that demands to be read aloud. Full of romping, chomping, whoo-whoooing, with crick-crick-crickets chirring, this poem delves into the dim-dimming woods and, with the help of nightfall-colored watercolor and digital art, soothes us to sleep. May’s Book Pick is this year’s Newbery-winning fantasy, THE GIRL WHO DRANK THE MOON, by Kelly Barnhill. On the annual Day of Sacrifice, Elders of the Protectorate (also called the City of Sorrows by some) collect the first baby born each year as an offering to appease an evil Witch. Except the Witch isn’t really evil, and she doesn’t understand why babies keep appearing in the woods. Instead of devouring them, Witch Xan takes them to grateful families on the other side of the forest. One year, though, things don’t go as planned. A mother refuses to willingly hand over her baby. She goes mad with grief, and is imprisoned by the Sisters in a tower. Xan becomes charmed by this infant, and accidentally allows her to become enmagicked by the moon. Since an enmagicked child would be too dangerous to leave with just anyone, Xan brings little Luna home to raise. The swamp monster, Glerk, and a Perfectly Tiny Dragon, Fyrian, make up the rest of Luna’s devoted new family. Luna’s magic is so strong that she does indeed become dangerous. Trees turn into birds, goats grow wings, and Glerk becomes a bunny. Desperate, Xan binds the magic until Luna can be taught to contain it. Except that the spell goes a bit awry, and Luna has no idea what magic is until just before her thirteenth birthday, when it begins to leak out of her with increasing strength. At this time, too, Xan’s magic drastically wanes, the slumbering volcano begins to awaken, the madwoman escapes her tower, the Sorrow Eater leaves on a mission of death, and another couple in the Protectorate refuses to give up their baby. Also, the Perfectly Tiny Dragon grows up! Kelly Barnhill has written a number of notable fantasies, beginning with The Mostly True Story of Jack, and more recently The Witch’s Boy. Though her work deals with matters of good vs. evil, right vs. wrong, her characters are usually nuanced and multidimensional. And there is always plenty of love, adventure, and magic. THE GIRL WHO DRANK THE MOON is a neatly woven, thought-provoking fantasy with an uplifting message: The world is good. Go see it. Have you read THE GIRL WHO DRANK THE MOON? What did you think? April’s Book Pick is the 2017 Printz Honor winner, THE SUN IS ALSO A STAR, by Nicola Yoon. Natasha doesn’t believe in fate. But she’s desperate enough to ask anyone—even fate—to help her find a way to stay in America. She’s been living as an undocumented immigrant since she was eight and her parents moved the family over from Jamaica. Now her father’s DUI means they to leave New York. Tonight. Natasha repeatedly visits US Citizenship and Immigration Services, hoping for a reprieve so she can stay in “the only place [she] calls home.” Finally, just hours before deportation, she’s handed a long shot: the name of a lawyer known as “the fixer,” and she arranges an appointment for that very day. I found Yoon’s characters to be so engaging that, right from the start, I was along for the ride. Natasha and Daniel are are caught up in realities imposed on them by their parents, but are desperate to forge their own futures. I think young readers will root for both of these kids. Yoon unravels her story mainly through narration by these two appealing protagonists. But their story is also enriched by voices of the people they meet, and lives they touch, in their search for answers. It's a captivating discussion of love, fate and the interconnectedness of the universe. Have you read THE SUN IS ALSO A STAR? What did you think? I’ve read some terrific books this past month—here they are, and what have you been reading lately?? Happy month of March and welcome to Book Talk for WOLF HOLLOW, by Lauren Wolk. This impeccably crafted, wonderfully heartfelt middle grade story was recently awarded a Newbery Honor. It’s one of my favorites from 2016, which seemed to me like an especially strong year for mid-grade. Twelve-year-old Annabelle lives a quiet life in rural Pennsylvania, until Betty Glengarry shows up with all of her cruel, bullying ways. Annabelle must protect her two small brothers, and also shell-shocked World War l veteran, Toby, even when town sentiment tries to dictate otherwise. Annabelle’s courage and compassion will touch readers as she learns to stand up for what she knows is right in this pitch-perfect coming of age story. It’s interesting to me that the author chooses to use a prologue to introduce readers to Annabelle’s story. In it, adult narrator Annabelle indicates she is looking back at her own childhood and describing, as she puts it, the way that, at age twelve, she learns to lie. The device allows Wolk to use a more adult tone throughout, which suits the quiet yet strong Annabelle very well. There’s a bit of an epilogue, too, which brings us back to grown Annabelle describing how that year, the year she turned twelve, she also learned to tell the truth. This haunting, yet hopeful, story shows the power of one young girl acting on her convictions. It’s an important message, artfully imparted. Or so I think!! How about you?? I’ve recently enjoyed these fine kid lit titles—maybe you will, too! ALL RISE FOR THE HONORABLE PERRY T. COOK, by Leslie Connor, was one of my favorite middle-grade novels of 2016, a year filled with especially strong middle-grade titles. Eleven-year-old Perry Cook, born and raised in the minimum security prison where his mom serves a term for manslaughter, knows all about family. In addition to his mom, Perry has grown up with plenty of loving, supportive people in the Blue River Co-ed Correctional Facility. This includes the warden, foreman, and many of the inmates (“rezzes”). Perry’s life isn’t conventional by any means. But Blue River is for nonviolent offenders, and the author shows us the people behind the mistakes they have made. When a DA with an agenda decides Perry needs a “real” family, he separates the boy from the only home he has ever known. Perry is an extraordinary character, as is his entire supporting cast. From Warden Dougherty, who okays the unusual arrangement, to Big Ed and Mr. Halsey, to Perry’s mom Jessica, best friend Zoey, teacher Ms. Maya, new lunchroom cashier Miss Jenrik, and even the deplorable DA Thomas VanLeer, these are fully-realized characters that have a mighty story to tell. Connor has written a feel-good novel that stands up to repeated readings. January’s Book Pick is Thunder Boy Jr., written by Sherman Alexie and illustrated by Yuyi Morales. Thunder Boy Smith Jr. loves his dad but hates that they share a name. Why can’t he be Sam, the way his mom had wanted? People call his dad Big Thunder, like "a storm filling up the sky." Jr. gets called Little Thunder, which sounds “like a burp or a fart.” He wants a name of his own, one that celebrates his own life and accomplishments. There are so many possibilities! Finally, Big Thunder reads his son’s heart, and Little Thunder gets a new name that celebrates both their love AND individuality. Alexie’s text is lyrical without wasting words. His narrator, Little Thunder, is appealing and full of life, with interjections in speech bubbles adding humor to this heartfelt story. And Morales uses textures scanned from wood and brick in her art, to build an appealing, stylized world. On every page, this team’s efforts combine to portray the pride and silliness, but most importantly, the affection that binds this family. It’s a terrific package, and has landed on many Best of 2016 lists. Headed for a Caldecott or Golden Kite? Regardless, it should find its way to many story times. Have you read Thunder Boy Jr.? What do you think? Have you read any great kid’s stuff lately? December’s Book Pick is RAYMIE NIGHTINGALE, by the astonishing Kate DiCamillo. How does she do it: write book after strong book, all different, and all worthwhile? Raymie Clarke is determined to learn how to twirl a baton. She’s got to win the Little Miss Central Florida Tire competition, so her father will read about her in the newspaper, leave the dental hygienist he ran off with, and come back home. But even though baton twirling lessons do not go as planned, Raymie meets Louisiana Elefante (daughter of the famous Flying Elefantes) and Beverly Tapinski (lock picker extraordinaire). Louisiana dubs them the Three Rancheros, “bound to each other through thick and thin.” Despite Beverly’s rather persistent grumbling, good-deed-doing ensues (sort of), as well as lots of adventures and insights into the human condition. Ramie’s soul expands and contracts as she considers such existential questions as the meaning of life, and the role of story. There is not one misplaced or casual word in this book. Each statement is elegantly crafted and contributes to the whole. It’s been said that each chapter of Because of Winn-Dixie could stand alone as a short story—while reading RAYMIE NIGHTINGALE, I felt like the entire novel was a short story. Everything single thing is important, and circles back around. It’s funny, and it’s wry, and it’s chock full of wisdom that will likely go over the heads of many readers who are enjoying the darkly zany plot line. But maybe they will find it again, maybe even years later and, looking through, be amazed at all that’s packed in here. Have you read RAYMIE NIGHTINGALE? What do you think? November’s Book Pick is UNBECOMING, by Jenny Downham, a story about three generations of red-headed women dealing with life, love, and dementia. Katie’s grandmother, Mary, suddenly turns up, and she's having trouble with her memory. She doesn’t recognize Katie, Katie's brother Chris, or even her own daughter, Katie’s mother Caroline. To make matters worse, Caroline and Mary have had an extremely difficult relationship, and Caroline bitterly resents having to take Mary in. It’s a mess, but Katie feels drawn to the mysterious grandmother she never knew she had. While Mary’s dementia is a challenge, Katie also struggles with her own issues. Like being seventeen and getting tormented for kissing her best friend Esme, dealing with intense pressure from her mom to be perfect, and figuring out how to take charge of her own, soon-to-be-adult life. Mary’s presence brings plenty of unanswered questions, and the family begins to peel back the layers to expose a whole slew of secrets and misunderstandings. UNBECOMING describes the importance of being true to one’s own self vs. the stifling power of conforming to expectations, while also creating a multi-faceted take on family, past, present, and future. The author creates compelling strands for all three women. But, first and foremost, it's Katie’s story, as she grows and begins to come into her own, allowing the stories of the others to feed into who she is and who she is struggling to become. Heartfelt and wise, UNBECOMING is also accomplished on a much more intimate level, with Downham (also the author of Before I Die) crafting beautiful words into beautiful sentences, into paragraphs and chapters that are a joy to read. Have you read UNBECOMING? What did you think? In PUG, Ethan Long tells a complete, funny story, with just 30 words (plus some doggie yapping). Pug wants to go out, but everyone is warm and cozy inside. Who wins? and why? Likewise, in UP, Joe Cepeda pulls off a wholly imaginative tale using only 27 words. In both cases, excellent full-color art does a lot of heavy lifting. These two books are standout examples of the genre. Welcome! October’s Book Pick is the wonderfully creepy mid-grade book, THE NEST, written by Kenneth Oppel, with occasional (and also wonderfully creepy) illustrations by Jon Klassen. There’s something wrong with Steve’s baby brother. No one really knows what, although it’s pretty certain he won't develop normally. When Steve first has the dream, he thinks he’s seeing an angel who tells him she has come to help with the baby, and this makes him feel better. The dream seems so benign at first. Angels want to help fix the baby. Such a hopeful dream. But dread slowly builds, as a swarm of strange grey wasps make their nest outside the baby’s room. The Queen begins to manipulate Steve, begins to change her story. Slowly, Steve comes to realize that her kind of help may not be the kind his family needs. As summer stumbles into fall, what great reads have you discovered? September’s Book Pick is WAITING, by the legendary Kevin Henkes. He’s previously won a Caldecott Medal, two Newbery Honors, and a Geisel Honor, and WAITING has brought new Caldecott and Geisel Honors. Also not to be overlooked is his supremely popular and beloved Lily (Lily’s Purple Plastic Purse), plus other mice characters which include Owen, Chrysanthemum, and Wemberly, each featured in their own charming picture books. But back to this story . . . .
Five animal toys wait on a window ledge. Mostly, they wait for different things, but one of them (a rabbit with stars) isn’t waiting for anything in particular. He just likes to look out the window and wait. Toys come and go, seasons come and go. Wind, rain, snow, fireworks, and the moon come and go. And still the animals wait on the ledge. One day a cat with patches joins them. What, if anything, is she waiting for? There’s so much character development here, and so much emotion expressed on these pages. If you have ever wanted to write—and publish—a quiet picture book, WAITING is one you must look at. Read it aloud. Marvel at the uncomplicated yet expressive text and illustrations, the uncluttered page design, the muted color, the incredible production value of this book. Look under the dust jacket and you will find a little surprise on the board covers. The end papers pick up the color of the type. It’s perfect. Have you read WAITING? What do you think? August’s Book of the Month is the impeccably crafted, heartwarming, and life-affirming THE WAR THAT SAVED MY LIFE, by Kimberly Brubaker Bradley. Ten-year-old Ada’s mam keeps her locked up in their squalid one room apartment because Ada is “a cripple.” (She has a clubfoot.) When her brother, Jamie, gets older and more independent, Ada resolves to fight for a better life for herself by learning to walk. She does, and just in time, too. London’s children are being evacuated to the countryside and Ada and Jamie sneak off to join them. A Kent woman, Susan Smith, reluctantly takes them in, but it’s not an easy transition. Susan is kind, but building a family takes time. Because Ada has never been educated or allowed outside, it’s heartbreaking to see how little she knows of the world. She’s strong and determined, however, and she teaches herself all kinds of things, beginning with how to ride the pony in the meadow outside her new home. Slowly, slowly, Ada grows healthy, learns to read and write, and finds friends in the village. But the emotional abuse inflicted on her all those years by her mam has taken its toll, and trusting that this new life won’t disappear is almost impossible. A wonderful book, THE PASSION OF DOLSSA, by Julie Berry (All the Truth That’s in Me), is historical fiction with a distinct magical touch. In 1241, a young noblewoman named Dolssa shares visions of Christ, her beloved. The Catholic Church arrests her for heresy, but she escapes before the burning. Botille, peasant from a small seaside town, finds Dolssa and saves her from the men who pursue her. Botille brings Dolssa to the tavern she runs with her two sisters, where they desperately try to keep Dolssa a secret. All plans fail when Dolssa shows an ability to heal the sick, and a friar obsessed with finding her appears. The writing is absolutely mesmerizing in this smart, literary tale. July’s Book Pick is the exceptional 2016 Caldecott winner, FINDING WINNIE: The True Story of the World’s Most Famous Bear, by Lindsay Mattock, illustrated by Sophie Blackall. A mother, cuddling with her son, tells of how Harry Colebourne, a Canadian veterinarian on his way to care for horses in WWI, spied a trapper with a baby bear. He bought the bear for $20 and named her Winnipeg to remind his fellow soldiers of home. Winnie sailed to England, where she became known as the Mascot of the Canadian Infantry Brigade. When the order came that it was time to fight, Harry took Winnie to the London Zoo. A boy named Christopher Robin befriended her and he named his own stuffed bear Winnie-the-Pooh. Christopher Robin's father, who was A. A. Milne, wrote about all sorts of adventures that Christopher Robin had with his stuffed animals in the wood behind their home. This is a charming story, framed as a cozy-but-true bedtime tale. We begin with endpapers showing the woods where bear cub Winnie plays, and end by learning how the author’s son, Cole, fits in (he was named after his great-great-grandfather). A family tree, as well as reproductions of old photos, a diary, and the official record card from the zoo, help illuminate the many layers of this story. The illustrations are also extremely descriptive, and beautiful, as well. Clearly, we are being offered an often-told, much-loved piece of family lore, passed down through generations, and now turned into this award-winning picture book. Readers of all ages will relate to the story the author tells her son about how one very special bear became the inspiration for A. A. Milne’s Winnie-the-Pooh. Have you read FINDING WINNIE? What do you think? Hello! June’s Book Pick is very funny MOTHER BRUCE, by Ryan T. HIggins. Bruce is a bear who is a grump. Apparently, the only thing Bruce likes is eggs, cooked into fancy recipes (which he finds on the internet). One day, after gathering all the ingredients for a rather intricate recipe (boiled goose eggs drizzled with honey-salmon sauce), Bruce returns from restocking wood for his stove, only to find that the main part of his breakfast has hatched. And the cute little geese think he is their mama! Suffice it to say that while the goslings have immediately imprinted on Bruce, it takes more than a few pages for this particular bear to begin to embrace his new family. I like how the author/illustrator jumps right in with his endpapers—we see Bruce’s forest home, even before the title page. So when the text actually begins, the scene has already been set. All we need now is that very grumpy bear. We can immediately learn about some of the things that Bruce does NOT like (sunny days, rain, and cute little animals). Also, the endpapers at the back of the story do nice job of playing us out, by depicting the Florida vacation spot this entire family has migrated to. May’s Book Pick book is this year’s Printz Award winner, BONE GAP, by Laura Ruby. When I first talked about this story, I called it both lyrical love story and chilling mystery. I’m going to add mythic retelling to the description. My second time through, the Persephone themes shone through much more strongly for me. This is a richly textured story with some really gorgeous prose. To the people of Bone Gap, Finn always seems to have his head in the clouds. When beautiful Roza disappears, Finn has trouble identifying her kidnapper, even though he was with her when it happened. Without any clues, people stop believing him, including the police and his brother Sean, who has lost more than any brother deserves to lose. Just as Finn feels Sean slipping away, he begins to find himself with Petey. The town of Bone Gap is full of secrets and magic, including talking corn, a huge black horse that appears out of nowhere, and the terrifying man lurking at the fringes of Finn’s vision. This highly original story is about love and beauty and seeing what no one else can. I think the author did a terrific job of weaving her ideas throughout the entire narrative, so that themes come and go and slowly build right up to the powerful conclusion. Have you read BONE GAP? What did you think? Have you read anything recently that you really enjoyed? Here are some of my favorites. April’s Book Pick is the Newbery award-winning picture book, LAST STOP ON MARKET STREET, with words by Matt de la Peña and pictures by Christian Robinson. It’s almost unheard of for a picture book text to be awarded a Newbery or even an honor, with the award typically going to the novel that the ALA panel judges to be the most distinguished piece of writing for children in any given year. So what makes this picture book so special and worthy of this honor? LAST STOP ON MARKET STREET is the story of CJ and his nana taking a bus ride through the city, on their way to serving a meal at their soup kitchen. CJ peppers his nana with questions—why do they wait for the bus when it's raining? why don’t they have a car? why do they always have to go here? and Nana answers by showing him the richness of life exactly as they are living it. The book portrays a diverse, urban, population. The prose is lovely, with well-placed repetition and descriptive language. Although they are not considered for the Newbery, the illustrations help to elevate this book to the very highest level of art and craftsmanship. Or so I think! What about you? Do you think that a picture book winning the Newbery might bring older kids, as well as new readers, to the genre? March’s Book Pick is a heartfelt middle grade novel, THE THING ABOUT JELLYFISH, by Ali Benjamin. Suzy Swanson is devastated when her ex-best friend Franny drowns the summer before seventh grade. Suzy cannot believe there is no rational, scientific explanation, that "sometimes things just happen.” It’s a terrible answer. On a class field trip to the aquarium, Suzy learns about the lethal Australian Irukandji jellyfish, is convinced that a sting from one caused Franny’s death, and becomes obsessed with proving this is the case. Woven into Suze’s present day trials in middle school is a portrait of her friendship with Franny, how it grew and changed over the years as the girls themselves grew and changed. Though very different, they are inseparable from the time they meet at the pool when they are five, until the day in fifth grade that Franny admits to liking Dylan—it’s all downhill from there, and we see how the relationship unravels. Shortly after Franny dies, Suzy decides to stop talking, and the story is very much about the importance of communication. It’s also about science and jellyfish (obliviously), about being different and finding your place, and it’s about Diana Nyad. It’s also warm and sweet and prickly and well-crafted. And brave and awful and I’ll stop now! There’s a definite downside to them, in that many amazing books don’t win the big awards, and maybe because of that they don't ever get the readership they deserve. Which is pretty sad, considering how subjective awards are. Conversely, I am very, very grateful to this year's awards for helping me get to some wonderful books I might not otherwise have read. A few I already had on hand because they were recommended by friends, and others I got after reading about the ALA winners and “best of the year" lists in online and print journals. So, beginning with Echo, February’s Book Pick, it’s been a rich time for reading recently! Susan Patron - Writing Tip of the Day. I have known 2007 Newbery winner, Susan Patron for many years. This former librarian is active in the SCBWI and has a well deserved reputation for her enormous talent, but also her generous heart. I was amazed by the grace and dignity that she conducted herself when her Newbery winner, "The Higher Power of Lucky," hit a firestorm of controversy over one little word, scrotum! I am so pleased that Susan agreed to give us a Writing Tip of the Day. Realize each day that everything in your story is connected, especially the most disjointed aspects, and you must discover those deeply hidden links between them. February’s Book Pick is the luminous ECHO, by Pam Muñoz Ryan, which recently won a Newbery Honor. When Otto gets lost in the forest, he meets three otherworldly sisters who infuse his harmonica with magic, and the tale begins. We follow as this harmonica touches the lives of three children who could all use a little magic: First there is Friedrich, who must save his father from one of Hitler’s concentration camps, then orphaned Mike in depression-era Philadelphia, and finally Ivy, daughter of Mexican American farmworkers in World War II California. All three children build better lives through their love of, and talent for, music. Structurally, this novel comes full circle, with the different narrative segments held together by the same magical harmonica. As each owner passes the instrument along, so do readers follow the path of this story. The writing is lovely, and while the vehicle is music, this novel celebrates art and artists of all kinds, as did the author’s previous work, THE DREAMER. Read ECHO and prepare to be inspired, energized, and enriched. Read anything really good lately? In BOATS FOR PAPA, by Jessixa Bagley, young Buckley lives with his mama in their small home at the beach. Every day they walk together on the sand, collecting treasures. Buckley begins making boats out of the driftwood he finds, and decides to send them to his missing papa, along with a note of love. Buckley knows that if the boats don’t come back, they must have managed to reach Papa. Buckley makes many boats and, while he still misses his papa, sending the boats helps to comfort him. The turning point in the story, when Buckley realizes that Mama has been finding his boats all along, is understated and charming. What are your favorite books of 2015? I have lots, but the list is not comprehensive in any way—I didn’t read nearly as much as I wanted to this past year—I never do! And I’m not finished with it yet, but MANNERS AND MUTINY, by Gail Carriger, is looking to be a strong favorite, too! December’s Book Pick is the fabulous DORY FANTASMAGORY, by Abby Hanlon. This chapter book is heavily illustrated by the author. In fact, I would go so far as to say that, with a six-year-old protagonist and illustrations filling every spread and nearly every page, in many ways DORY can be viewed as a 153-page picture book! The irrepressible Dory, tellingly nicknamed Rascal by her family, has an older brother and sister who won't play with her. Luckily, Dory's friend Mary (who is invisible to everyone but Dory) always wants to play, thinks Dory is the greatest, and even sleeps under her bed. Despite the constant chatter (to Mary, of course), the temper tantrums, and the weird quirks (like wanting to wear her flannel nightgown day and night all summer—except for the time she wears her cow costume, of course), Dory is an incredibly endearing and imaginative character. Her story is completely perfect for the age and format, and this is a stellar example of fine literature for young people. Abby Hanlon did her own illustrations, seamlessly weaving them into her text, but writers who do not illustrate should feel confident that they, too, can tackle this genre. And illustrated books are highly desirable right now, repeatedly asked for by editors and agents. Have you read DORY FANTASMAGORY? Well, if not, have at it and enjoy!!! Merrily Kutner - Writing Tip of the Day. I met Merrily for the first time at this year's SCBWI National conference. Pretty, kind, and fun, Merrily was a blast to hang out with. Not only is she a poet, she teaches writing classes at UCLA extension. I asked her to give us a writing tip of the day. She gave us two, one from her and one from our dear departed Sue Alexander. The best tip I ever got was from Sue Alexander: Type out 5-10 pages of your favorite picture books in manuscript format. Now analyze what the artist chose to illustrate. Check to see what actions or words were illustrated and what was told only in the pictures. Here are some great books I have enjoyed recently—what are you reading now? 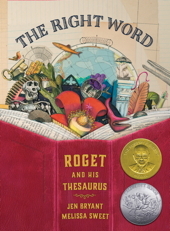 September’s Book Pick is the gem of a picture book, THE RIGHT WORD: ROGET AND HIS THESAURUS, written by Jen Bryant and illustrated by Melissa Sweet. The text of this nonfiction book is clear and concise. It’s packed with information, and will easily support multiple readings by kids of all ages. But, beyond a doubt, the text is helped immensely by the brilliant design and illustrations that make THE RIGHT WORD very special. a brilliant student: bright, intelligent, clever, smart, astute, intellectual; gifted, talented, able, adept, skillful; elite, superior, first-class, first-rate, excellent; informal brainy. ANTONYMS stupid. his brilliant career: superb, glorious, illustrious, impressive, remarkable, exceptional. ANTONYMS unremarkable. a shaft of brilliant light: bright, shining, blazing, dazzling, vivid, intense, gleaming, glaring, luminous, radiant; literary irradiant, coruscating. ANTONYMS obscure, dark. brilliant green: vivid, intense, bright, bold, dazzling. ANTONYMS dull, dark. There is so much information packed into these 32 pages plus back matter, but not once does if feel heavy or didactic. If you have not yet read THE RIGHT WORD: ROGET AND HIS THESAURUS, run—don’t walk—to your nearest library or bookstore and find yourself a copy!! Today my Writing Tip of the Day is from my good buddy Barbara Bietz. We've been in the same writers' group since 1994, and I value her precise critiquing, good humor and hand-holding over the years. Not only has she published a successful middle grade novel, Like a Maccabee (Yaldah, 2006), she was on the committee of the Sydney Taylor Book Awards and has a popular blog, Jewish Books for Children. I give you Barbara Bietz's Writing Tip of the Day. “Voice” is an illusive concept, difficult for most of us to define. Over the years I have formed ideas about voice that help keep me from getting stuck. I think of voice as an extension of the adage, “write what you know.” When a writer is immersed in a world that feels natural and comfortable, the voice will come organically. Our August Book Pick is ALL THE BRIGHT PLACES, by Jennifer Niven. I found this wonderful story to be uplifting and heartbreaking in equal measure. What was most striking to me about it is the contrasting trajectories of the two main characters, Violet and Finch. They first meet upon the ledge of a bell tower, each of them contemplating a jump. Finch, as is clear pretty early on, is bipolar, and Violet is the survivor of a car accident that killed her older sister. In one of his "awake" phases, Finch does his best to charm Violet (of course he has a crooked smile!) and he eventually succeeds. Through his attention and energy, he allows Violet to begin to live again--to break out of her self-imposed stasis and mourning and realize she will not be betraying the beloved sister who cannot grow with her. Finch, meanwhile, becomes more and more unpredictable as he senses himself moving towards a "sleep" period. He eventually takes to his closet to wait out this inevitable dark time, beyond the reach of anything Violet can do for him.